With Halloween fast approaching, I'm actively on the lookout for both creepy and campy Halloween entertainment. 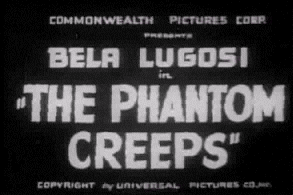 The Phantom Creeps, starring Bela Lugosi as scientist Dr. Alex Zorka is definitely in the latter category, with the usual over-the-top creep show we expect from one of the godfathers of spookiness. As Adam Finley once said, the doctor's fiendish goal was to destroy the world using bad special effects. If MST3k was a favorite, you saw more than one of these episodes already; if not, you can create your own back channel. Public Domain Torrents seems to be the best place to find downloads of all the old episodes, although the image quality could be slightly better. Keep in mind you need a BitTorrent client, like uTorrent in order to download the actual movie files.